Improved HOG-2 now available - designed to fit your requirements to 100%! If you are interested in the Hog-2 please take yoour time to send us a Specification- and RFQ-datasheet. Note: due to the effort being spent for a detailed quotation we charge 100,-EUR net for a detailed quote - complex specs may face a higher charge. 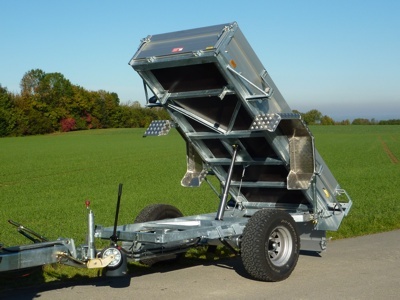 You will get full refund when placing an order for the quoted trailer. Too muich for you at this stage of the project? Well, then the trailer will be too much for you as well. 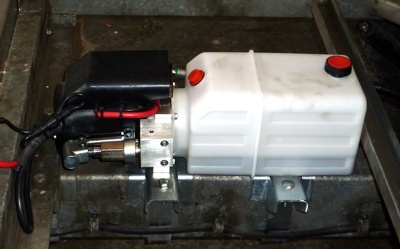 This electro-hydraulioc pump unit will ease the usage of your dumper. Unload with the push of a button - convient, no need to step out of the vehicle or stop. Standrd delivery is with a wired remote control. Optional a R/C is available that can control a winch as well (4-channel model). Based on a standard AL-KO support leg we modified thias unit. 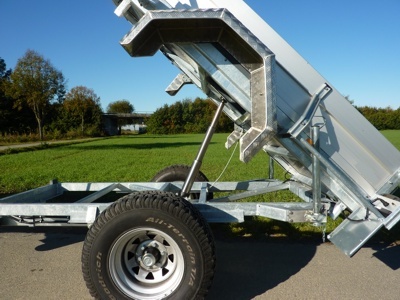 It comes with a massive mounting bracket and an aggressive offroad footplate that will literally bite into the ground. Definitely no slipping. Additional holes provide a way to drive earth nails through for increased stability. 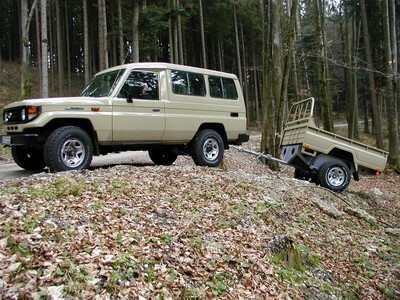 The first trailers were equipped with the box originating from the Toyota Land Cruiser HZJ79 - sometimes with cover as shown below. The trailer is designed to give better offroad performance and ground clearance than a HZJ78 with a heavy OME suspension. 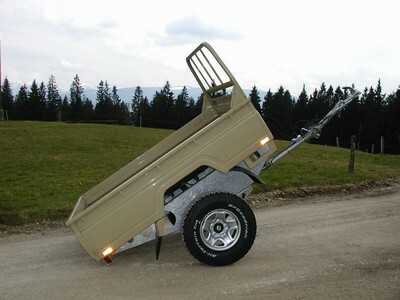 The axle is designed of being able to carry 1.4 tons as continuous load. 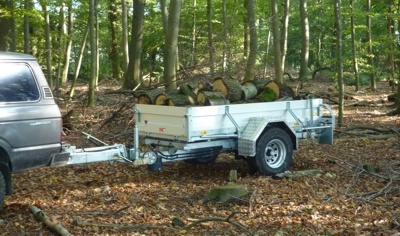 This trailer serves behind my fellow BJ42 now for more than 3 years under heavist professional conditions in the rocky Oberpfälzer woods without any problems. The following wheels and tires can be fitted: 206-16, 235/85-16, 7.5-16, 8,25-16, 9-16, 33x9.5-16, 265/75-16, 285/75-16. Wider tires than 235/85-16 just need a ribbon lip to be legalized in Germany. 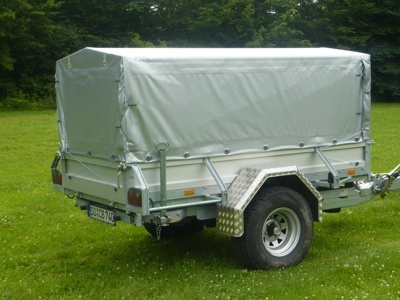 The trailer is equipped with a 1.5m long pulling rod in case you want to transport cajaks or other long things. 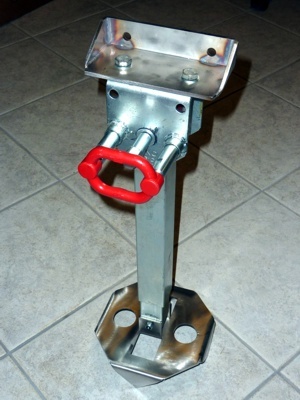 You easily can shorten this rod to your desired length since it is not welded to the frame but massively clamped. 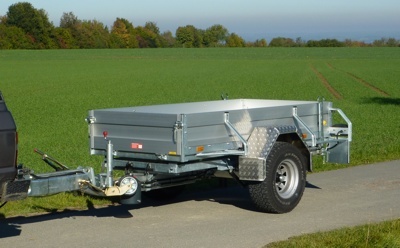 The trailer pictured is equipped with 235/85-16 tires. The 2nd generation since 2007 serves our customers' and our needs - proven in harsh envireonments and usage since then.